Using a system of 20 trapped calcium ions, physicists in Austria have demonstrated what they describe as the largest register of entangled, individually controllable quantum bits (qubits) shown to date [Phys. Rev. X]. The team was able both to encode a complex initial state in the 20-ion ensemble and to demonstrate entanglement among those individual qubits at various stages of the system’s evolution. Moreover, by using both analytical and numerical “entanglement witnesses” developed in the work, the team found that it could detect not only entanglement among pairs of neighboring ions, but “genuine multipartite entanglement” among neighboring groups of three, four and even five ions. The result, according to Ben Lanyon, a co-leader of the research at the Institute of Quantum Optics and Quantum Information (IQOQI), Innsbruck, provides evidence that ion-based quantum simulators—which some view as a way station on the road to full-fledged quantum computers—do indeed provide a window into otherwise inscrutable quantum behavior. “We’re building confidence,” he says, “that we are accessing complex quantum states” in these simulators. Quantum simulators use systems of atoms, ions or other qubits to model quantum behavior beyond the abilities of classical computing algorithms. They’ve come a long way in the past year, with several groups successfully building simulators involving 50 or more qubits. But Lanyon says these experiments with larger ensembles haven’t yet demonstrated the level of control of each individual particle in the system, and of particle entanglement, shown in the 20-qubit Innsbruck experiments. To achieve that control, the IQOQI team employed a radio-frequency Paul trap to set up a register of 20 calcium ions in a linear array. Next, the researchers used laser fields to flip every second qubit, setting up a specific initial Hamiltonian, or energy state, for the system. They then quenched the system at various time steps, and used quantum-state-dependent resonance fluorescence imaging, via a single-ion-resolving CCD camera, to measure the state of each qubit. The IQOQI team next dug into measuring the level of entanglement among the qubits. Estimating the full quantum state density matrix for the 20-qubit ensemble would have required assessing billions of measurement bases. So the researchers focused on the set of bases required to reconstruct the density matrices of all neighboring 3-quibit groups in the linear array—a much more tractable problem involving only 27 bases. Using those density matrices, and a parameter called the genuine multipartite negativity, they were able to establish that all adjacent pairs of the linear array became entangled very quickly as the system evolved. But what about multipartite entanglement, among larger numbers of qubits? To assess that, Lanyon and his co-lead investigator, Rainer Blatt, turned for help to two groups of theorists, Marcus Huber’s team at IQOQI’s Vienna branch, and Martin Plenio’s research group at the University of Ulm, Germany. The theoretical groups devised two complementary entanglement witnesses that could be used to establish higher orders of entanglement. Huber’s group offered a relatively simple, analytical method that was effective at inferring entangled triplets from the two-qubit observables already established by the Innsbruck team. For detecting multipartite entanglement among collections of four and five qubits, Plenio’s team provided a computationally intense, “brute force” numerical search technique. Putting all of the techniques together, the Innsbruck team was able to establish that adjacent pairs of particles in the linear system quickly became entangled, and that quantum correlations built up among triplets, most quadruplets and some quintuplets as the system evolved in time. Establishing multipartite entanglement for groups of more than five qubits outstripped the computational power that the team could bring to bear, and “remains an open challenge,” according to the paper. But even that five-qubit limit, according to Lanyon, might be a feature rather than a bug, since it underscores that the simulator is indeed demonstrating quantum behavior beyond the reach of classical algorithms. An international task force of metrologists has updated the values of four fundamental constants—Planck’s constant (h), the elementary charge (e), Boltzmann’s constant (k); and Avagadro’s number, NA (Metrologia, doi: 10.1088/1681-7575/aa950a). The new values for these constants, which rest on an analysis of state-of-the-art measurements from a worldwide assemblage of metrology labs, won’t, alas, change the morning reading on your bathroom scale. But they’re a big deal for metrologists, as they set up a comprehensive reassessment of the International System of Units (SI), or metric system, slated for November 2018—when the metrology community is expected to redefine all seven basic SI units solely in terms of fundamental constants and invariant properties of atoms. The redefinition of these fundamental constants represents the latest step in a long, slow march away from physical, “artifact-based” SI standards and toward standards based on exact values of fundamental constant. Perhaps the most celebrated physical standard was the platinum-iridium bar located in Paris that, for decades, denoted the precise dimensions of the basic SI unit of length, the meter. Metrologists would like to achieve a similar fundamental-constant-based standard for all seven basic SI units: the meter, the second, the mole, the ampere, the kelvin, the candela, and the kilogram. This would enable researchers worldwide to make authoritative measurements using precisely the same standard units anywhere on the planet, and on any scale of measurement. The kilogram constitutes a particular thorn in the metrology community’s side; it is the last remaining SI unit that still is defined by a physical artifact—“Le Grand K,” a platinum-iridium cylinder stored in France that has represented the standard kilogram since 1879. In principle, that means that local standards for the kilogram elsewhere in the world must be calibrated directly against that physical original. In other cases, standard SI units have been defined by theoretical ideals difficult to realize in practice. For example, temperature has been defined in terms of the triple point of pure water in a sealed glass cell—begging the question of how to make the water sufficiently pure, and of potential measurement inaccuracies as one gets farther and farther from the triple point. In principle, defining the SI measurements in terms of the exact value of fundamental constants avoids these local and practical difficulties—but it requires a highly precise, international consensus definition of the values of the constants themselves. The work of creating those consensus values for h, e, k, and NA falls to the Task Group on Fundamental Constants of the international Committee on Data for Science and Technology (CODATA), which periodically reviews fundamental-constant values based on the best available experimental evidence. The team proceeded by collecting measurements from multiple techniques and labs, and using a number of techniques to harmonize the data and minimize uncertainties. For the redefinition of Planck’s constant and Avogadro’s number, for example, the CODATA task group relied on a suite of measurements using a so-called Kibble balance and X-ray crystal-density measurements of a specific sphere of ultrapure silicon-28. As a result, the task group was able to hammer down uncertainties in these constants to just four parts per billion. The four new constant definitions join three other constants—the speed of light, the hyperfine transition frequency of cesium (ΔνCs), and the luminous efficacy constant (Kcd)—that have previously been exactly defined, and have been used to provide definitions of units such as the meter, the second and the candela. The new definition of Planck’s constant, which has units of kg-m2/s, will be used to provide a worldwide, invariant definition of the kilogram, replacing “Le Grand K”; the new standard Boltzmann’s constant will underlie a constant-based definition of the kelvin temperature unit, superseding the definition based on the triple point of water. The task group members stress that the changes to these constants will have little relevance day to day, in the lab or elsewhere. “The whole thing,” said Peter Mohr, a member of the task group who works at the U.S. National Institute of Standards and Technology, “is geared to not have any impact on the average person.” Yet it the shift will have considerable relevance to contemporary metrology researchers, whose work increasingly involves measurements at precisions undreamed of in earlier eras. For this reason, according to CODATA, while the shift to the full suite of SI units based on the new values of these fundamental constants will be decided in November 2018, its official rollout won’t come until 20 May 2019—“World Metrology Day”—to give the community time to adapt. Tags: ART- Anomalous radiative trapping, Astronomy ( 7,565 ), Astrophysics ( 4,700 ), Basic Research ( 10,464 ), Cosmology ( 4,891 ), ELI Beamlines - European Extreme Light Infrastructure Beamlines ( 2 ), Exawatt Center for Extreme Light Studies, Optics & Photonics, QED’s double-edged sword, The ART of gamma-ray creation, Toward a Better Gamma-Ray Source? The advent of lasers of petawatt peak powers, at facilities such as those of the European Extreme Light Infrastructure (ELI), has physicists licking their chops for a previously unavailable, extremely bright source of high-energy gamma-ray photons for new kinds of experiments. But just how “high” can “high-energy” be? Previous simulations have suggested that as laser peak powers reach lofty petawatt levels, the laser field itself can start to run into fundamental limits. Those limits are tied to strong-field quantum electrodynamic (QED) effects, which can, through complex feedbacks, eventually sap the energy of the laser field driving them. As a result, it’s generally been assumed that efficient gamma-ray production from these new petawatt-peak-power lasers would be limited to energies well under a billion electron volts (GeV). One reason for doubts about maximum attainable energy has to do with the previously inaccessible physics of strong-field QED that petawatt-peak-power lasers will suddenly put on the table. On the plus side, the strong fields of 10-PW-plus lasers, interacting with and accelerating particles in an electron–positron plasma, can cause those particles to radiate a large fraction of their energy as energetic gamma-ray photons. That, in turn, has raised considerable anticipation that these soon-to-be-launched high-peak-power lasers could provide a source for high-energy gamma rays for new kinds of experiments. But there’s a catch. As the flux of gamma-ray photons produced by these light–matter interactions increases, a significant share of those high-energy photons would themselves interact with the laser field to create a cascade of electron–positron pairs, through the QED process of pair production. The result would be an increasingly dense plasma cloud in the laser field that would rapidly pull energy out of the field itself, quickly erasing its ability to create additional gamma-ray photons and preventing its use as a sustainable a gamma-ray source above a certain energy threshold. The team behind the new research—led by physicist Arkady Gonoskov of Chalmers University of Technology, Sweden, along with colleagues at Chalmers, the Russian Academy of Sciences, Lobachevsky State University in Russia, and the University of Plymouth in the U.K.—sought to get around that limit. To do so, they looked in detail at the interaction of the electron–positron cascade with another process in these high-energy laser fields, so-called anomalous radiative trapping (ART). In ART, using a complex set of parabolic mirrors, 12 laser pulses can be focused into a dipole standing wave that traps electrons and positrons. The trapped particles are then oscillated in the wave in such a way that they gain substantial energy and have a high probability of emitting a substantial part of that gained energy in a single gamma-ray photon. As with other approaches to gamma-ray creation, the increasing gamma-ray flux from ART leads to a pair-production cascade and a growing plasma cloud of electrons and positrons. But using advanced 3-D QED particle-in-cell (PIC) numerical simulations, the Gonoskov team was able to establish that, at laser powers above around 7 PW, it’s possible to keep that cascade from putting a lid on the laser field’s energy for gamma-ray production. Putting the that promise to the test outside of numerical experiments, of course, must await the full production implementation of petawatt-scale lasers in ELI and elsewhere. In a press release accompanying the study, Gonoskov noted that the team’s concept “is already part of the experimental program proposed for one such facility: the Exawatt Center for Extreme Light Studies in Russia,” currently under construction. With excitement continuing to build over the next year’s planned launch of the James Webb Space Telescope, it’s easy to forget that its predecessor—the Hubble Space Telescope (HST), originally put into Earth orbit more than 27 years ago—still has some great science left to do. The latest evidence: researchers have used the superior angular resolution of the HST’s Wide Field Camera 3 to directly determine, through the gravitational bending of light, the mass of a white-dwarf star 17 light years away (http://science.sciencemag.org/content/early/2017/06/06/science.aal2879). What is now called “gravitational microlensing” was one of the most famous predictions of Einstein’s general theory of relativity. Under that theory of gravity, massive bodies such as stars actually deform the space around them; as a result, the theory predicts that the spatial warping could deflect light from distant stars around such a body. That prediction, made in 1915, was borne out four years later in a celebrated experiment by the British astronomer Arthur Eddington, who measured the deflection of a background star’s light by the sun’s gravity during a total solar eclipse. Einstein himself blithely noted that “of course, there is no hope of observing this phenomenon directly,” given that the chances of such alignment are remote in themselves, and because the angular deflection of light by a star outside of our solar system “will defy the resolving power of our instruments.” The most one could hope to observe, he wrote, would be an increase in the apparent brightness of the closer of the two stars. Some eighty years later, scientists did have an instrument with potentially sufficient resolving power, the HST. But they still needed to find a pair of stars with the right alignment at the right time. To do so, researchers in the United States, Canada, and the United Kingdom—led by Kailash Sahu of the Space Telescope Science Institute (STScI) in Baltimore, Md., USA—computationally scoured a catalog of more than 5,000 nearby stars. They looked for candidates that had particularly rapid apparent motions in the sky, and that thus might have a better shot at lining up in the right way with a more distant star. They settled on the white-dwarf star called Stein 2051B, around 17 light years from earth. They then observed Stein 2051B (using the HST’s Wide Field Camera 3) seven times over the course of two years to assess its gravitational effect on light from a specific, much more distant background star around 5,000 light years away. Even with the HST’s superior resolving power, that effect was tough to see; Stein 2015B appears about 400 times brighter to an Earth observer than the background star, and the lensing effect was expected to be around three orders of magnitude smaller than the one observed by Eddington during the 1919 eclipse. Nonetheless, the team did indeed manage to tease out the gravitational lensing of the distant star’s light by the closer one—the first measurement of such a deflection by a star other than the sun. The STScI-led team went further, however, using the angular deflection they observed from the light of the background star to get at the mass of the closer Stein 2015B. Under Einstein’s equations, the radius of an Einstein ring relates directly to the square root of the mass of the closer (lensing) object. While, even with the HST’s sensitive instruments, the research team did not directly observe an Einstein ring, they were able to infer the ring’s radius over the series of measurements through the slightly asymmetric apparent offsets of the distant star and their impacts on the closer star’s brightness. As a result, the researchers were able to put the mass of Stein 2015B at 0.675±0.051 solar masses—right in line with the theoretical expectations for a white dwarf of its radius. That observation was interesting in itself, since Stein 2015B in particular has attracted some controversy, with suggestions that it might represent an exotic “iron-core” white dwarf with an anomalously large mass. 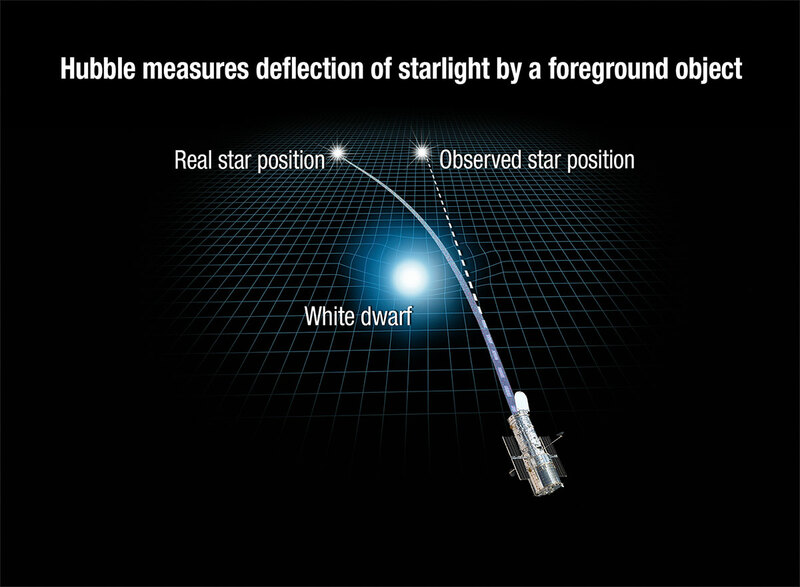 The new observations suggest that the star actually lies right in the white-dwarf mainstream. 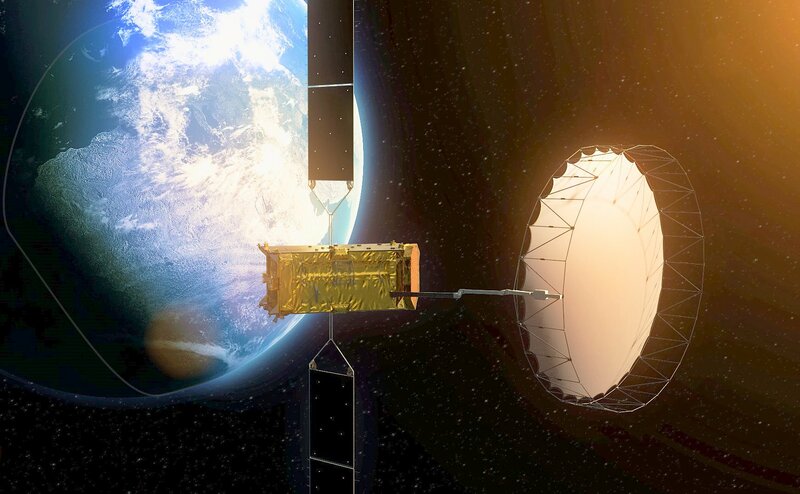 Preparing for a proposed Canadian quantum-communications spacecraft, researchers from the University of Waterloo, Ontario, uplinked secure quantum keys from a ground-based transmitter to a receiver that was mounted on an aircraft passing overhead (Quantum Sci. Technol., doi:10.1088/2058-9565/aa701f). Thanks to new research from two separate, global teams, QKDs may head up toward the sky and stars. [Image: iStock]. Across the globe, a team from the Chinese Academy of Sciences sent entangled photon pairs from the country’s quantum-technology satellite to two different ground stations (Science, doi:10.1126/science.aan3211). And researchers at the Max Planck Institute for the Science of Light, Germany, were able to demonstrate ground-based measurements of quantum states sent by a laser from a satellite 38,000 kilometers above Earth’s surface—using components not even designed for quantum communication (Optica, doi:10.1364/OPTICA.4.000611). 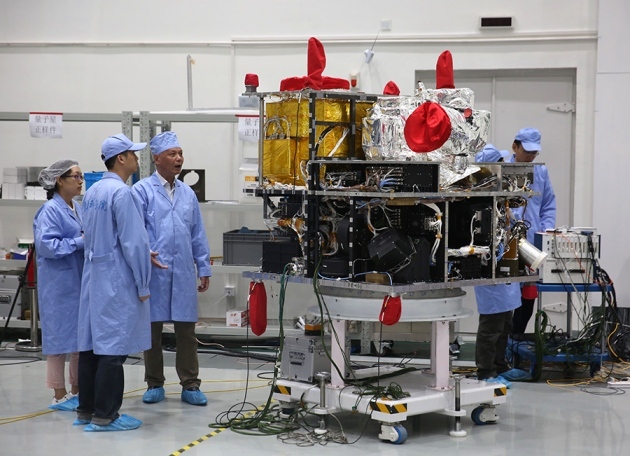 Last August, China launched the world’s first satellite for quantum optics experiments. China’s 600-kilogram quantum satellite contains a crystal that produces entangled photons. Cai Yang/Xinhua via ZUMA Wire. Now researchers from multiple Chinese academic institutions have transmitted entangled photons from two widely separated ground stations via the orbiting satellite, officially named Quantum Experiment at Space Scale (QUESS) but informally dubbed Micius or Mozi after an ancient Chinese philosopher. In the German experiments, coherent beams from a 1065-nm Nd:YAG laser communications terminal on the geostationary Earth orbiting satellite Alphasat I-XL, originally lofted into space in July 2013, were received at a transportable optical terminal then located at the Teide Observatory in Tenerife, Spain. The terminal was equipped with an adaptive-optics setup that corrected for phase distortions and piped the signal into a single-mode fiber, and used homodyne detection to pull out the quantum signature.